The Chubb Corporation (CB), through its subsidiaries, provides property and casualty insurance to businesses and individuals. This dividend champion has paid dividends since 1902 and has managed to increase them for 32 years in a row. The company’s latest dividend increase was announced in February 2014 when the Board of Directors approved a 13.60% increase in the interim dividend to 50 cents /share. The company’s peer group includes Travelers Cos (TRV), Allstate (ALL), and Cincinnati Financial (CINF). Over the past decade this dividend growth stock has delivered an annualized total return of 12.40% to its shareholders. The company has managed to deliver a 9.40% average increase in annual EPS since 2004. Chubb is expected to earn $7.37 per share in 2014 and $7.89 per share in 2015. In comparison, the company earned $9.04/share in 2013. Chubb has a record of consistent share repurchases. Between 2006 and 2013, the number of shares decreased from 423 million to 259 million. The typical property and casualty insurer has no moat, because the products they sell are basically commodities, where the cost of policy would not be known for several years. As a result, many companies have the tendency to underprice themselves in the pursuit of premiums growth. However, Chubb seems to have a more disciplined approach to handling premium volumes, and seems to be concentrating more on maintaining the quality of premiums received and only accepting the rates that adequately compensate for risk, rather than chase premium growth at any cost. The company has also set itself apart by focusing on personal insurance and specialty insurance segments. With its personal lines insurance segment, the company targets high net worth persons. There are some switching costs for high networth individuals, because insurance companies require an assessment of the value of fine cars, homes or other objects, before deciding to insure them, which means those customers have a higher tendency to stay. The specialty insurance offers a wide variety of specialized professional liability products for privately held and publicly traded companies, financial institutions, professional firms, healthcare and not-for-profit organizations. Chubb Specialty Insurance products primarily include directors and officers liability insurance, errors and omissions liability insurance, employment practices liability insurance, fiduciary liability insurance and commercial and financial fidelity insurance. These risks are unique, and require a very strong management discipline. Overall, Chubb has a competent and able management, which has resulted in good results for shareholders. However, the business is not idiot-proof, which could be a problem if a reckless risk taker succeeds current CEO when he retires in 2016. If interest rates start increasing, this could result in higher earnings from the premiums float that is being invested. 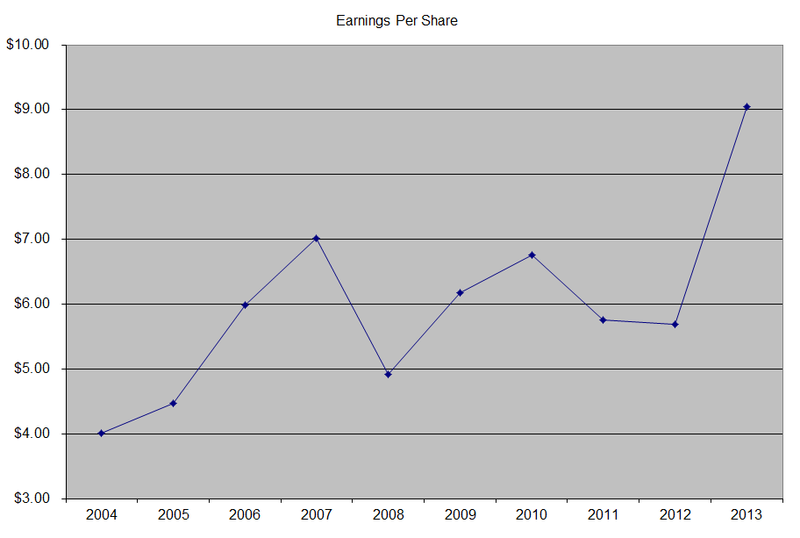 As a result, it is quite possible that earnings per share could increase significantly from this tailwind. The annual dividend payment has increased by 9.20% per year over the past decade, which is in line with growth in EPS. 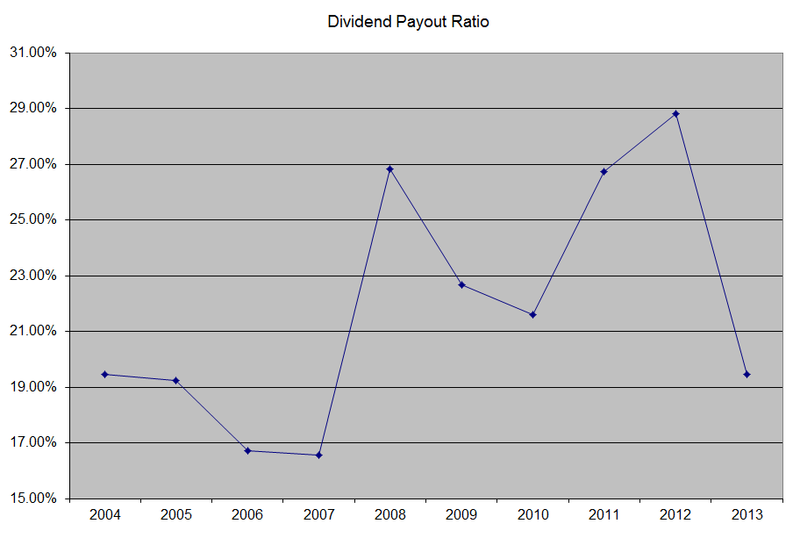 A 9% growth in distributions translates into the dividend payment doubling every eight years on average. If we check the dividend history, going as far back as 1987, we could see that Chubb has indeed managed to double dividends every nine years on average. The dividend payout ratio has largely remained below 29% throughout the decade. A lower payout is always a plus, since it leaves room for consistent dividend growth minimizing the impact of short-term fluctuations in earnings. In Chubb’s case, a large portion of cashflow is spent on share buybacks than dividends. 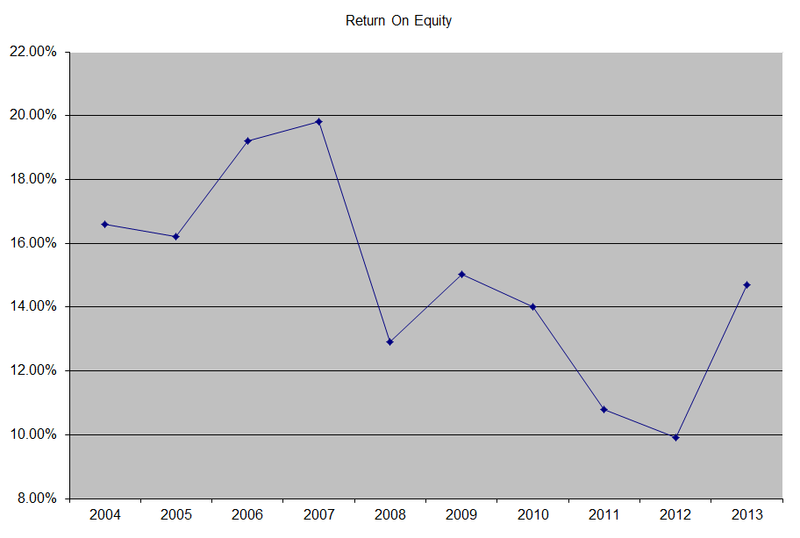 The return on equity has been in a decline between 2007 and 2012. Overall the amounts for 2013 are just slightly lower than the amounts in 2004. Rather than focus on absolute values for this indicator, I generally want to see at least a stable return on equity over time. Currently, the stock is attractively valued, as it trades at a forward P/E of 11.80 and yields 2.30%. I am analyzing the company because I believe it is quality dividend growth stock, which will be a very good addition to my portfolio on dips below $80/share, which is equivalent to a current yield above 2.50%. 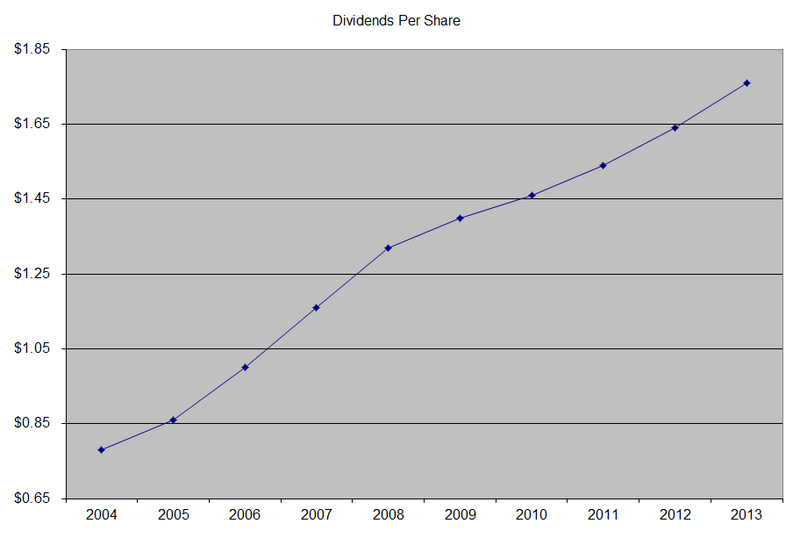 - Does entry price matter to dividend investors?